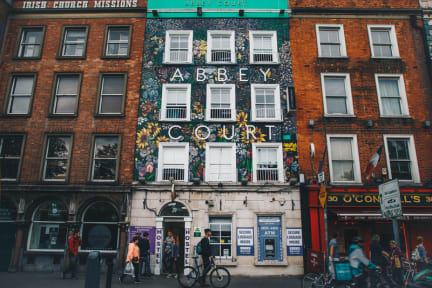 Abbey Court, Dublin, Irlandia : Rezerwuj teraz! One of the best hostels I have been to! Great value! Perfect location for sightseeing. Maybe a little bit noisy because you are in the center so some people can have problems with sleeping at night but as I said this perfect location for sightseeing. You can even catch public bus 16 and 41 from/to airport and don't have to pay much for transport. Staff is very very very helpful. Remember breakfast starts at 7:30 so you have to book early breakfast few days in advance if you want to eat earlier. Great place really close to the city center. Rooms and bathrooms are quite clean, there are lockers for luggage but you need your own padlock. Fast internet wifi. Breakfasts are not good. Overall place was excellent but the biggest issue was the bed. Whenever I moved it made noise. Because of that, I had two sleepless nights. The location is perfect.